Feel inadequate about your change success? Here’s help. It’s time to get real about change. Personal change or life change. Or any change, really. Because guess what? It rarely happens in a neat, practical, straight line. And those who will have us believe this about a change they have made are probably embellishing a little bit – to say the least! 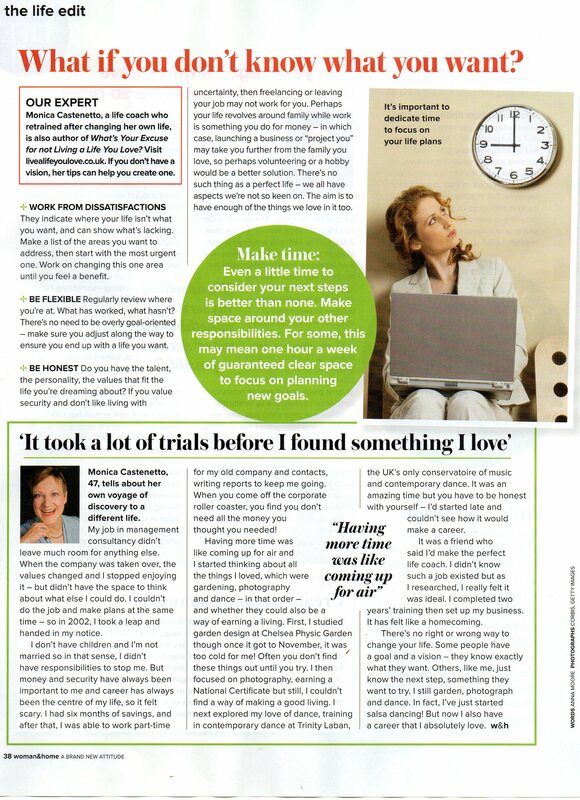 “I read your profile in Woman & Home. It is the first time I have come across a successful career changer who honestly highlighted that finding a new calling is by no means as linear and clear-cut as many have us believe. Stories regarding career or life changes usually go straight into finding success, which makes one feel rather awkward in failing to come up with a similarly clear thought pattern. Have you ever felt awkward or inadequate, too? About your ability to make changes in your life, I mean? In my life, I’ve been at quite a few crossroads, knowing that I’d outgrown what I’d been doing, yet not knowing what next. And I’ve always had a strong sense that I needed to find what I was really meant to be doing in this life. Create a life that felt ‘truly like me’. And at first, I didn’t know what that was, either! In my own journey towards the life I love I have initiated and been through a lot of changes. I went by planning as well as experimentation, going with what I did know at each time, and taking it step-by-step. At times I didn’t know what I wanted. (Are you doing what you want?) I’m sure I’ve made a few excuses along the way, for not getting on with a change. (Here’s how to overcome them.) I’ve had my ups and downs, ‘Doing’ times and ‘Being’ times, breakthroughs and u-turns. And lots and lots of experience and learning! And change hasn’t just been prominent in my own life: As a former change management consultant and now life coach I have helped a lot of organisations, groups and individuals define and create the change they wanted. And that’s ok. There’s no need to feel awkward or inadequate about your own efforts to make it happen. I have seen many times, in myself and in others, that in any change journey, unexpected and unforeseen stuff can happen. You make an exciting new discovery, or come across something you didn’t know. You find a short-cut, or you stumble and fall (into a new and interesting path, or into a deep hole, or a pit full of water). You might decide to get up and scramble out of the hole, and find a creative way to bridge the chasm that has opened in front of you. Or you adjust your course, or even turn back. All the while keeping the vision of the change you want alive, as well as the faith that you can ‘get there’. I find all this quite awe-inspiring! And it has shaped not only me as a person, but also my approach as a life coach, and the way I work with my clients. Perhaps you get to where you wanted to be with your change, and feel great satisfaction and joy, as well as relief for having made it through those peaks and valleys. Or you ‘get there’, and then you don’t feel as good about it as you thought you would (U-turn, anyone?) Then again, perhaps you never ‘get there’ at all – willingly or not. Whichever your experience: It’s ok! The experience of trying to create a change, whether you ‘get there’ or not, changes you. You learn along the way. About yourself, about what you really want, and about what is right or wrong for you. You learn about other people. About the world. Perhaps you love your change experience, or you suffer from it. Hopefully, you deepen as a human being. And become more compassionate, and open, and soften. Learning, whether the easy or the hard way, seems inherent in every change. As such, change is the vehicle for our personal and spiritual development as human beings. And every change journey is valuable, no matter how it unfolds, and where it leads (and whether it turns out as you thought it would). Every change is as much about the journey than about the destination. Do you find this, too? Ever since I’ve realised this, I’ve felt released of the pressure of making my change a ‘success’, or feeling a failure if it didn’t turn out how I wanted it to. There are many ways of measuring success. The straightforward ‘set-a-specific-goal-and-get-there’ paradigm is just one. It might work for some of us, some of the time. In life it’s important to learn to grab our power of choice and actively influence how we want to live our life and where we want it to go. Yet it’s also important to acknowledge that not all is in our control, and to learn to be ok with that when we experience this. Then ‘not-getting-there’, or ending up on a meandering instead of a straightforward path to change will feel realistic and valuable, instead of a failing. I’ve had a small correspondence about this stuff with my lovely Woman & Home reader. “Making changes can be extremely stressful, especially when they are not voluntary. And when change, for whatever reason, doesn’t materialise or present itself as we had hoped, it can be frightening and disheartening, and make us feel lethargic, not knowing how to move on without falling into the ditch. Many thanks to her for inspiring this blog and allowing me to share her feedback! Has this got you thinking, too? I’d love to learn about your experience and thoughts about making change happen. Thank you for letting me have your comments below. And if you want to enlist my structured, intuitive, empathetic and effective help in making your change happen, check out my coaching programmes. Or email me to arrange for your free and no-obligation call with me, to discuss what you need, and how my coaching can best help you.